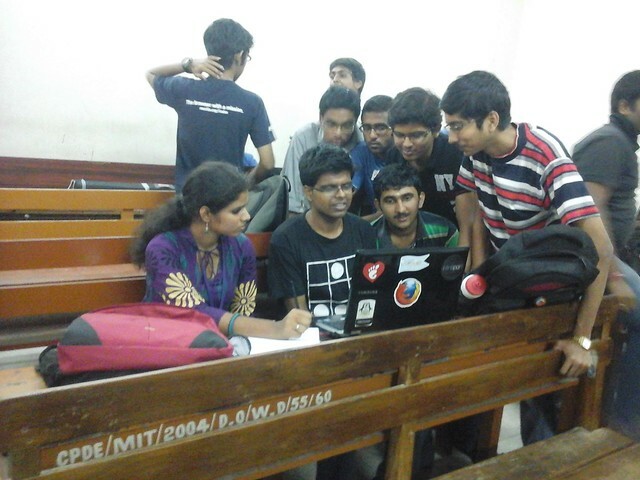 MIT Firefox OS Hackathon – What does the Fox say? 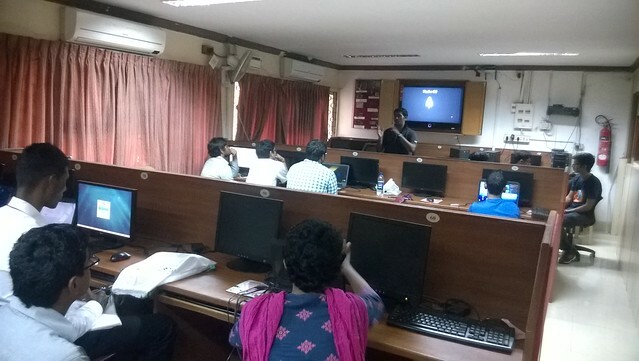 On 16th of February, Madras Institute of Technology, Chrompet, celebrated their Annual Technical & FOSS Festival by Computer Society of MIT. As a part of this, there were many events. They wanted Mozilla to be a part of this. 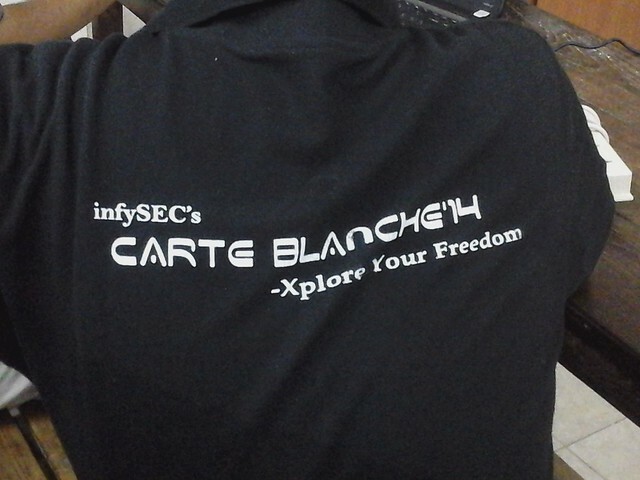 Mozilla conducted a Firefox OS hackathon as a part of Carte Blanche. 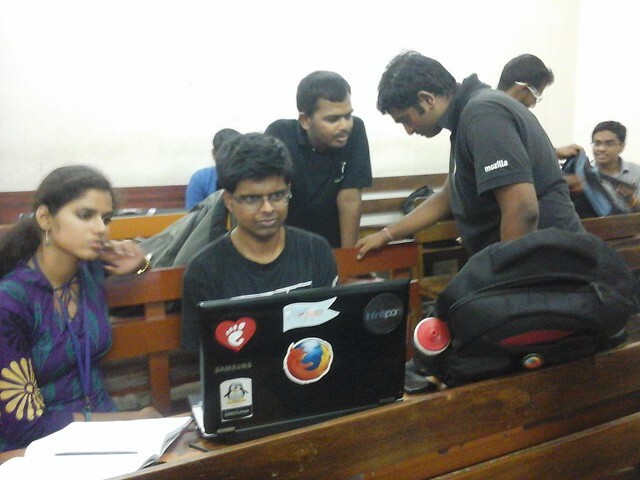 The organizing team consisted of 2 Mozilla Reps- Naresh and Viswa, and 3 Mozillians apart from me. 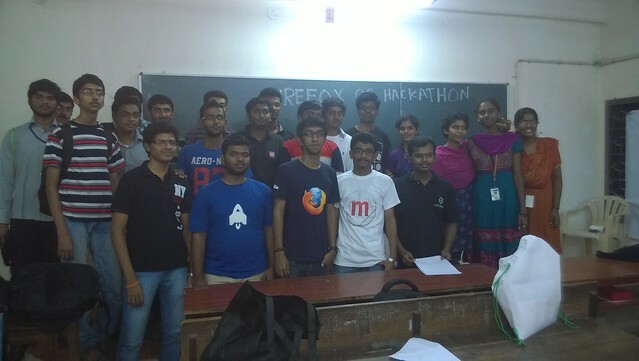 The Mozillians along with me who helped in organizing the hackathon were Nikhil Patel, Shashank Gaikaiwari and Satya Krishna. The 4 of us belong to Sathyabama Firefox Club. At around 9:30 am, we reached Chrompet station where Naresh was waiting for us. We met Naresh and in a short while Viswa also arrived. Since we had never been to MIT before, something that surprised us was the fact that MIT is right under the overbridge that is the exit from the Chrompet station. We were greeted by Arun, who was the point of contact from MIT. We were taken to the lab where the event was to take place. The volunteers from MIT, namely, Arun and Harish tried their best to arrange for things inspite of an unexpected power shutdown in Chennai. Eventhough we initially had trouble with internet connection, thanks to the efforts for the volunteers and the technical staffs, it was fixed soon. We really appreciate their efforts. 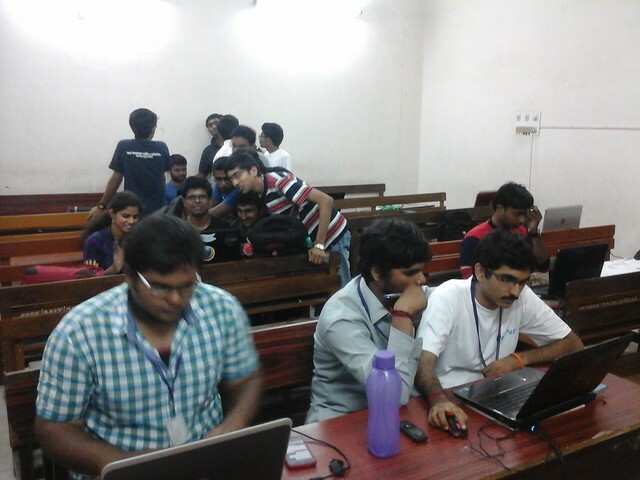 The session started at around 10:30 am by Viswa. Initially, there were around 10 participants. After a while, when the Firefox banners and vertical standees were placed outside the venue, we had more and more people interested in participating. Towards the end, we had around 20 participants. 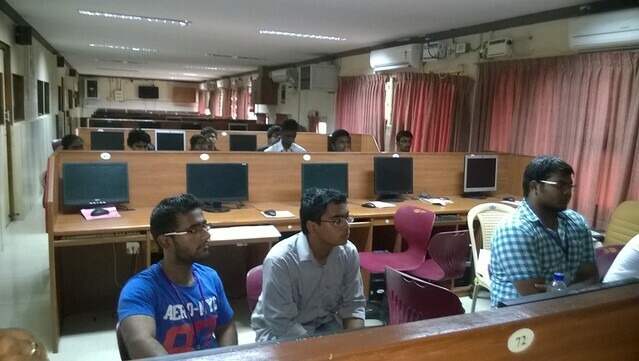 Naresh took over the session and told the students about the internal structure of the Firefox OS. He mentioned about Geko and Gaia. The students were really interested and the session was really interactive even though there wasn’t a big crowd. He taught them to create the Manifest file and about the Webapp file used to upload to the marketplace. 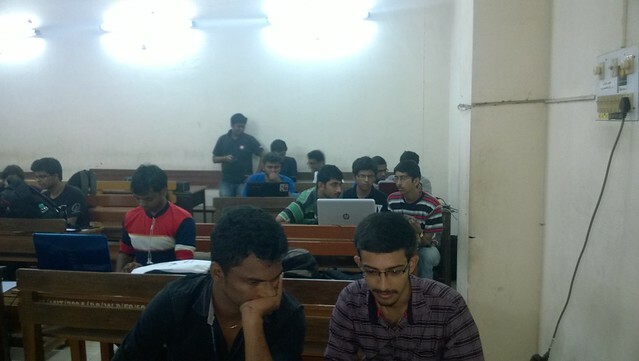 We then asked the participants to ensure that they have the latest version of firefox and Simulator. We also gave them a lot of Mozilla goodies. Naresh showed Demos of the Mozilla Developer Network and the basics of using it. I told them about the Student ambassadors activity:”App of the month” contest and that if they develop apps based on the theme “Valentine’s Day”, they could participate in that competition too. They were really excited on hearing that. Soon enough, the students started developing.We were told that we had to shift the venue post lunch at 1:30PM since there wouldn’t be back up power supply in that lab. The participants departed for lunch at around 1:45pm and we had our lunch too. After lunch, we walked to another block in search of the new venue that was allotted for the hackathon. We were lost and entered a different block. We could see lots of kids solving the Rubik’s Cube. Literally, the kid was doing one after the other non stop. He was really fast too. We stood looking at the group of kids AMAZED at what we just saw. Each of us had different stats in solving the Rubik’s cube. 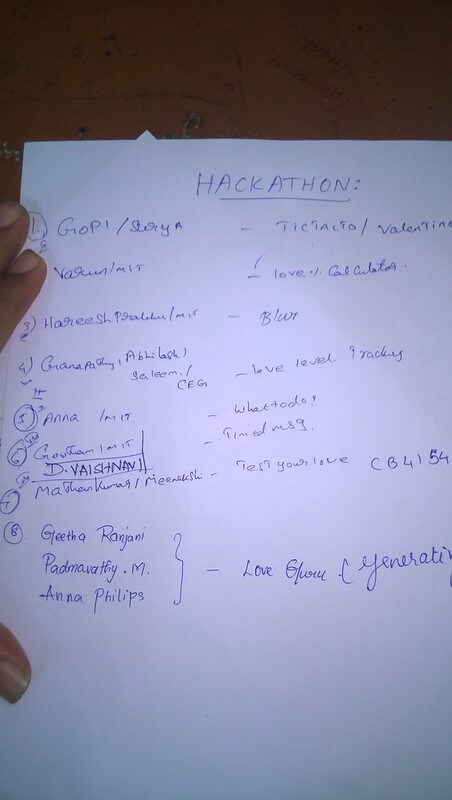 We later moved to the venue of the hackathon. It was a normal classroom. Just when we thought we might have some difficulties, the volunteers came in with extension chords and many 3G dongles, thereby solving the problem of charging the laptops as well as internet. Towards the end, we announced that the time was up and asked the teams to present their ideas and apps. It was really nice to see the apps as well as listen to the ideas of the teams. After all the apps were presented, the judges decided the winners. The winners were presented with cash awards as well as Mozilla tees. After the event, all the participants as well as the organizers departed after taking a group photo to cherish the memories of the day. Pingback: Mozilla comes to MIT | What does the Fox say? Pingback: Inaugural Event at MIT | We are the Mozillians!